Since our big Kal-Haven trail walk in June, we’ve continued to walk, but we haven’t gone on many long walks—and in particular, haven’t gone on any very long walks. What’s the boundary between ordinary long walks and very long walks? I choose to set an arbitrary dividing line of 14 miles. This is because Jackie and I, by merest happenstance, turn out to each remember having walked 14 miles as our “longest hike ever” in the years before we’d met. It was with all that in mind that I suggested a couple of days ago that we should go for a 15-mile walk today. I had in mind more than just ticking off the “very long walk” box. With winter coming, I want to be sure I don’t start thinking that ordinary winter weather is a reason not to go for a long walk. It was chilly this weekend, so I thought a good opportunity to ease our way in to walking in the cold. There are also scheduling issues that’ll make it hard to get a very long walk in during the next week, so it seemed today was our big chance. It was a wonderful day for a walk—beautiful, clear, sunny weather, crisp in the morning, but reaching 60 in afternoon. We walked up First street to the research park, then turned east and walked along the south end of the Arboretum and through Orchard Downs, before turning south again so we could take a turn through Meadowbrook Park. Then we headed back north along Vine as far as downtown Urbana, so we could have lunch at Crane Alley. (Good beer. I had a Deschutes cinder cone red on nitro. Jackie had an ESB, although I forget which one.) From there we headed west toward campus, headed back south to have coffee at Espresso Royale, then meandered through campus, crossed the railroad tracks and Route 45 to head south along the Boulware path, stopping at Schnucks to get some half&half and tomato paste. The total distance came in at 14.62 miles, comfortably over the line into “very long walk” territory by my standards. I didn’t take many pictures, but I did get this one of Jackie in front of the Alpha Sig frat house, Chuck McCaffrey’s old fraternity. This would have been along about mile 10 of our walk. 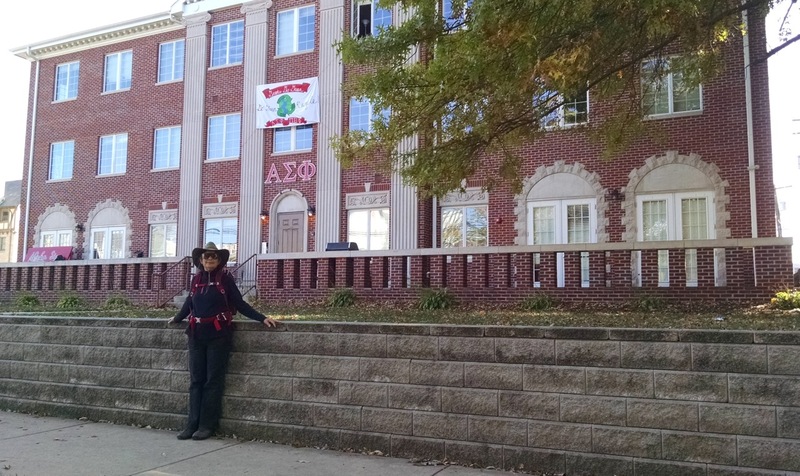 Jackie in front of the Alpha Sig frat house (Chuck’s fraternity). Oh, and I wanted to mention that I wore my new boots! I bought a pair of Lems Boulder Boots, minimalist-style boots that I got with an eye to being my main winter boot this season. I got them five or six weeks ago, and have worn them as my everyday boot for most of that time, but this was their first try on a very long walk. Fortunately, they worked great. Glad the boots worked out! Sounds like a great walk! Thanks! It was a great walk. And I liked the boots so much, I even wrote a review, but it doesn’t seem to have been posted on the Lems website so far. I’ve enjoyed reading your postings for the past several years. First at wise bread and then I followed you here. 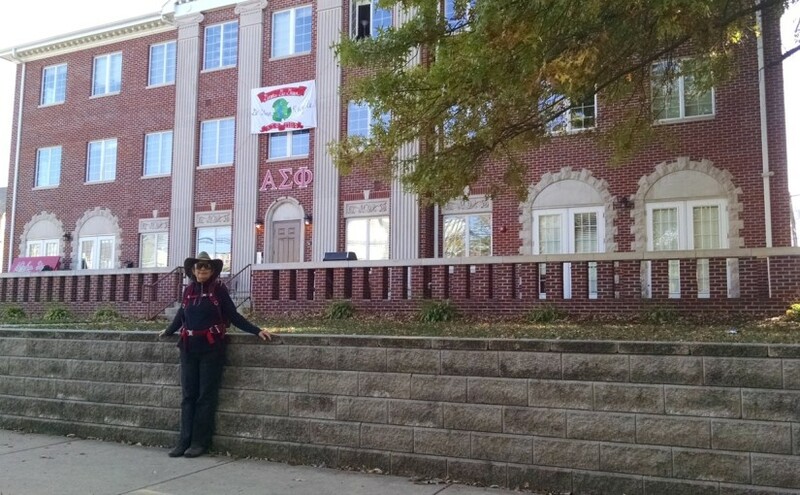 I checked your page today and boom… a picture of my old frat house at the U of I. I knew I liked you! P.S. I graduated 15 years ago…If this is the same Chuck McCaffrey… I think he was still pretty involved with the house while I was there. He was a mentor/authority figure.